Several people have mentioned the idea of using the Pi to help relatives and carers support older people in their own homes by monitoring aspects of their daily routine as well as things like the indoor temperature, but until now, we hadn’t seen anyone write up a system they’d implemented. So we were very interested when we received an email from Jamie Grant, telling us how he had used a Raspberry Pi-based home monitoring system to help him support his late mother in maintaining her independence. 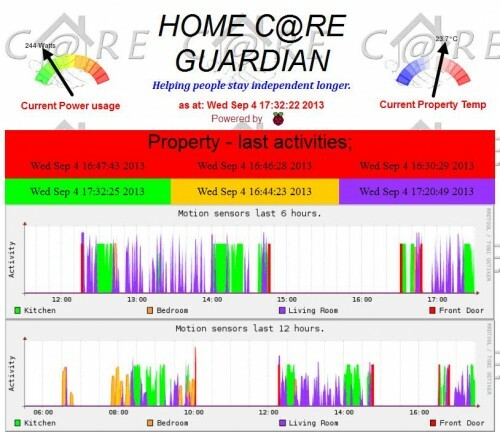 I found Homecare Guardian a great comfort and my sister and I used it daily to check on her condition. Near the end mum was more forgetful and sometimes left her front door open, we could see whenever this happened and I would call round and check she was alright. Mum managed to stay totally independent and was only admitted to our local hospital for her last week where she got the best possible care. Jamie has continued working on the wireless sensors and their power requirements: his latest PiR motion sensor is powered by just two AA batteries and has a battery life of over a year, and his new door sensor has an estimated battery life of over three years. With sensors for motion, door opening, indoor temperature and water (to provide flood alerts) ready to go, he hopes to add a humidity sensor soon. The same system, he observes, could also be used for checking an unoccupied property for flood or frost risk as well as other aspects of security. Very recently he has been working with an Android app developer, and they’re hoping to add an alerts app facility soon. The system has been renamed as Pi HomeGuard, and you can see a working live site, all running off a Raspberry Pi, at www.pihomeguard.com. Jamie is interested in taking this prototype further and making it more widely available, and would be glad to make contact with people who’d like to become involved; if this describes you, say so in the comments, and we’ll put you in touch. The kettle power spike monitor is brilliant. Its unobtrusive and can be a very good indicator of when a daily routine becomes interrupted. Webcams might be considered by many independent elderly people to be too intrusive. Its probably going a bit far to ask an octogenarian to wear a bluetooth/wifi fitness bracelet, but the contents of a Texas Instrument Sensortag or the Broadcom Wiced Sense could feasibly be worn around the neck if packaged differently. One question I would ask is how secure is this data ? Also how about an anxiety level monitor for the person actually viewing the data and ahving to deal with the consequences ? About 10 years ago there was a commercial product: the “i-Pot”. It was a kettle monitor. My father’s spin was “what if we found a nice bottle of Merlot”. Great stuff. I too have spent the last 9 months building a similar system with multiple alerts and some funkey stuff with wireless sensors and some home automation. Can someone at Pi Towers put me in touch with Jamie. I would like to know more. Possibly get involved. I live 180 miles from my Mum and I think this sounds like a great idea. I’d certainly be interested in getting involved. This is a great idea and allows our older family members to remain independant with a non intrusive monitoring service. Please put me in touch with Jamie. Excellent work. I would like to know more, and am interested in becoming involved. I have some experience and an interest in home monitoring in Canada. I am a real-time systems engineer and was considering building something like this for my 86 year old mother-in-law. I am extreemly interested and would like to help. I am very new to this raspberry pi thing having just bought one for my grandson but have spent most of my working life in computers, I spent about four years working for a part of the NHS installing commercially produced systems like the ones being developed in this blog so I might be able to contribute a few ideas. I am also working on developing a means of communicating with people with dementia, living in their own homes who are finding telephones and certainly mobiles too complicated. It would involve the help of an android application programmer. Keep up the good work. I work for an FQHC health center that has recently expanded its “Care Coordinator” program which involves working closely with a lot of our elderly patients. This project could have some useful applications in that area. I am very interested in your project. I live in Washington State. I have elderly parents. Please allow me to participate. Thanks for considering my offer of help. My mini Pi server is taking 000s of hits at present, sorry if anyone finds it a bit slow. When I get time I’ll publish some more news on the Android app, which is working really well. Full control of all configuration inc colours etc all from the app. This is the perfect answer to the age-old question: “But what is it good for?” A journey of a thousand miles begins with Hello World, and takes us to places like PiHomeGuard. I have a Pi with a webcam that monitors movement – it emails me at work or can send an SMS so I know my Mum (92) is up and moving around. Just having those emails tick over while I’m at my desk is a great comfort. It’s really lovely to read comments like yours! This is such a wonderful project! I strongly believe that a business can be started out of it. I am very much interested in contributing to this in any way i can. Please connect me to Jamie. Like many others I had a similar idea; After a bit of thought I considered the bare minimum sensors, to non-intrusively detect normal activity, was power and the kettle spike phenomonen and a water flowing meter\sensor. The presumption being that a loo refills in a regular way and can be detected as a water spike. The Pi could then learn patterns of behaviour and raise warnings of varying severity if the pattern changes or dissapears. I’m the maintainer of the Raspbian (minimal) unattended netinstaller and I’d love to add features (if needed) to support your project. Awsome project, just what i have been looking for. Would love to know more about the project. It is exactly the kind of help my parents need to be able to stay independent. 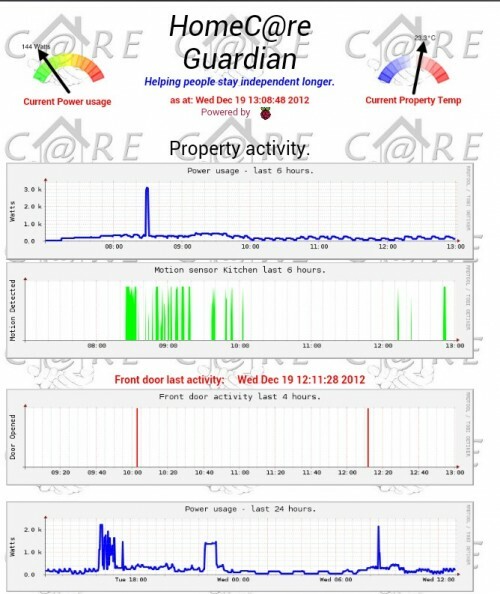 It would also be great to use for monitoring our remote holiday home. You can now register interest in the project as a user/consumer at http://pihomeguard.co.uk/ – if you mean you’re interested in becoming involved with developing the project in some way, let me know here and I’ll pass on your email address to Jamie. I am also working on a similar project. V1 used RaspiCam based movement detection but suffers from a lot of false detections from varying light cause by local vehicle traffic. V2 detects activity with an IR detector and displayed the results using an ncurses based graph over an open SSH session backed up by a Raspi Cam or webcam. V3 is web-based – I have tried but have backed away from external IOT services and am currently using MySQL as a database. Would also be keen to contribute to this project so please put me in touch with Jamie. I am looking for a cost effective way of way of checking whether external doors are locked without creating an eyesore with lots of wires – Does anyone have any ideas for this? I added a cmd line sendmail program to my grandma’s PC so that every time she turned it on, it sends an email to myself and sister. She usually checks her email or facebook every day, so is a good indicator of activity. That’s pretty impressive on the part of your grandma. I’m not sure I’ll have the gumption to adopt new technologies when my kids have grown-up kids. Interested in collaboration /investment. I’ve a strong background in home/building automation/control systems. UK based, how that’s not a problem. R.
Hi, that’s an awesome project and one I follow since I’ve looking into setting up a monitoring system for my house since we got a basement flood back in June. Let me know if I can help. Forgot to add this to my comment, how about adding a carbon monoxide sensor, smoke and fire sensor, also air quality sensor. Are there any sensors which can check on your furnace to see if it works properly? Thanks again. It’s great to see so much interest in this project! I’ve passed on to Jamie the email addresses of everyone who has asked to be put in touch with him, and I’ll watch out for anyone else commenting who would like me to do the same. I’d be very grateful if you could pass my contact details on to Jamie. I work in technology in the elderly care market in the UK, and I can see massive potential benefits for older people through this project; I’d love to contribute. Judging from the interest level, I strongly suggest that a new forum topic is started (HomeGuard ?) so everybody can keep informed and contribute. Recently had an issue with a elderly relative, where she called to let us know that the power had cut off. We traveled up the next day to fix the issue to also find that the heating hadn’t been working for about a week, but it wasn’t mentioned as they “didn’t want to cause a fuss”. Both were fix in 5 minutes (only took 5 hours to get there). The remote temperature feature would have been great to know about this beforehand. I would suggest the following optional features; a secondary battery power supply (so power outages can be recorded), and secondary internet connection (USB mobile broadband dongle), so that if the primary fails (ISP issue, or no power) an alert can still be sent. Also under some situations a USB dongle might be a cheaper way to connect to the internet if there are no other uses for it. I’ve implemented a very similar feature for my home monitor. I have a battery backup and when the mains power fails, the USB dongle sends me an SMS :-) A simple cron job that runs every night ensures the dongle returns OK when sent AT and if it doesn’t, I get an email. I need this, and very soon. Mom is 88 and widowed, and routinely will let things go because she does not wish to trouble us. Thank you for the excellent solution to monitoring. fantastic idea, good opportunities to develop add ons etc. Awesome! Now if only I could stop thinking about what the NSA could do with this. What a great idea. They must be a huge market in the US for the Baby Boomer generation. I would like to suggest adding a panic button in case grand mom or grand dad had a problem and needed help. Interesting project. Please pass my details on to Jamie as I’d like to get involved if I can. My mom had a stroke recently and her mobility is limited. I’d like to install a system like this. Please include me in the development. it’s a great project and product … could be used for many applications. The greatest challenge is the wireless and long life sensors ! (ok the android app is a real plus as well ;)). How to get updated is there is a kickstarter started ? or a product launched ? or some sources openned ? etc. I did my registeration of interest on the website but is there more I can do ? Great information…so what’s the next step? I was wondering if more technical details were available, and if you’d thought to add camera / motion detection support into the system? That’s a project I’ve been thinking about for a while and I’d be interested in getting involved, if its something that fits? Or learning about the approach / architecture. Please ask Steve Amir if he would mind sharing his dongle SMS script with me. I needed something for my alzheimer mother (79).